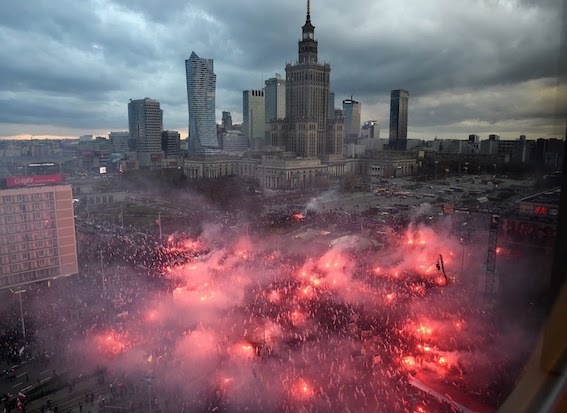 On November 11th, 60,000 people mobilised by the Far Right marched through the streets of Warsaw on a Police Independence Day march. Poland and Hungary are two EU member countries where the Far Right has been able to mobilise, greatly encouraged by the Right populist and chauvinist parties that are in government there. There are some, particularly on the British Left, the Lexiters, who believed that a Brexit vote would open up the way to further progress. In reality, it has been the Right and Far Right in Europe that that has been strengthened. It is a sad indication of the disorientation of the ‘internationalist’ Left over Europe, that it is the ultra-nationalist Far Right that is able to mobile internationally across Europe for its vision of a ‘White Christian Europe’. Because British Left has no alternative vision for Europe, it is leaving it to the Far Right to put forward its European vision to counter the neoliberal EU bureaucracy. Instead the Lexiters are trying to revive a British road to socialism, this time via a Corbyn-led British Left government. The following two articles are from Tony Greenstein’s blog (see http://azvsas.blogspot.co.uk). The first article describes the politics of the march. The second shows the close relationship between the Israeli state under Benjamin Netanyahu with the Right populist governments of Poland and Hungary, and explains this link.